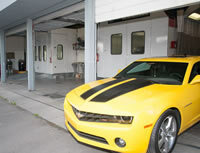 Lakewood Auto Bodyis a family owned and locally operated auto body repair and car painting/truck painting shop in Puyallup, WA. Ever since we laid our foundation in the year 1962, we have been meeting the car painting and auto body repair needs of Ferrari owners in Puyallup area. With 27 years of combined experience in car painting/truck painting, our ASE and I-Car certified mechanics are dedicated to offering exceptional services that ensure happy customers. They use high quality industrial finishes, and state of the art tools and equipments including computerized paint matching systems. Do you wish to restore the brand new appearance of your Ferrari car? Restoring the brand new, original appearance of your car will help increase its durability, and increase its resale value. However, you must ensure that the paint job is done efficiently and by skilled and experienced technicians. An uneven car patch spray or careless car paint job done will give your car a messy look. It is because of this that car painting/truck painting is actually considered more as an art than any simple mechanical work. Why Choose Lakewood Auto Body in Puyallup, WA? The skilled, certified and experienced technicians at Lakewood Auto Body, based in Puyallup, WA has been working their best to earn your trust through honesty, ethical services and top notch customer services. We believe that the word of mouth publicity earned through satisfied customers will work better for our business than fancy advertising. If you are around Puyallup area and are searching for a professional auto paint shop for your car painting need, trust only the experts at Lakewood Auto Body.